I saw my first Christmas advertisement on TV before Halloween. There are fewer Thanksgiving Cozies available than Christmas Cozies. I’ve been watching the Hallmark Christmas movies for almost a month. It’s unusually warm here in San Antonio. All the stores have had their Christmas items displayed for weeks. P.S. Here is the list I’ve compiled of Thanksgiving mysteries, here’s the Christmas list (which is so long that there are several pages of them! ), and for those of you still interested in Halloween mysteries, here’s the Halloween mystery book list. Deanna, I hope you had a happy Thanksgiving! Melissa, happy Thanksgiving to you too! Also a Hallmark movie fan, especially those with a Christmastime setting. Currently reading two Christmas Cozies by Vicky Delany and Donna Andrews, but don’t necessarily read books appropriate to the season. You make it so easy to keep up with the world of cozies and I echo the sentiments of others in thanking you for that. 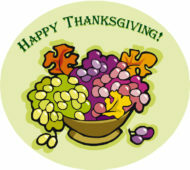 I wish you and all who celebrate the holiday, a Happy Thanksgiving. Ingrid, happy Thanksgiving to you too! Happy Thanksgiving! I am thankful for this site. I, too, have been watching the Hallmark Movies and I started a Christmas themed jigsaw puzzle this week. Don’t judge me, but I have finished my Christmas shopping and wrapped the gifts, decorated the tree, and the inside of the house. I will do the outside lights tomorrow. Today after dinner I will help my mom decorate her house. KG, we’re just getting started getting our own tree up – so no judgment here! And happy Thanksgiving to you too! Happy Thanksgiving. I don’t shop so I have not seen any stores. I read Daryl Wood Gerber’s Halloween themed book only, I’ve never read anything xmas like. Thank you for all your work here. Laura, happy Thanksgiving to you too! Happy Thanksgiving, Danna!! Hope you had a wonderful day! Linda, we had a good, unexciting Thanksgiving this year – just immediate family. I have to admit I do prefer it this way a bit. And happy Thanksgiving to you too! Happy Thanksgiving Danna, and all the Americans on this list. I’m somehow not surprised that you’re moving on to Christmas books already, Danna. We don’t celebrate Thanksgiving here, but Halloween is a thing, commercially, and the Christmas stuff starts sneaking into the stores even before that! Usually around the end of September, in fact, which means it’s been working on peoples’ awareness for nearly two months already… and it’s not even December, yet! Have fun, everyone – whatever you’re reading! Happy Thanksgiving and echoing.. THANKS for all you do!! BTW.. up here in Northern Massachusetts we had snow flurries today and on Monday we had about an inch of snow/ice on the windshields. Kathy, I hope that the cold weather lets up a bit! And happy Thanksgiving to you too! Susan, do you mean the Killer Wore Cranberry anthologies? If so, they are listed on the Thanksgiving page, under the editor’s name (J. Alan Hartman). That’s how I handle most holiday anthologies with multiple contributing authors, as I’m always a bit unsure where to put them under a specific author. Actually, right now I am finishing a Sally Goldenbaum non-holiday offering called Moon Spinners in the Seaside Knitters series (which I’ve read almost all of her books to date). She has a couple Christmas ones, one of which is called A Holiday Yarn and the other is called Trimmed with Murder. Love them both and I really like the whole series but I don’t read them according to a schedule-just when I can get them from the library! Since you have provided us with a long list of Thanksgiving books, I’ll start on that when I finish these two. Try a Goldenbaum mystery-A fun cast of likeable characters that you want to visit Sea Harbor, MA. I recommend this series highly and also Vickie Fee’s It’s Party, You Can Die if You Want to. That is a cute series as well. To all of you readers out there-and Danna. Happy Holidays and drive safe! Rob, happy holidays to you too! books that have a Winterish theme…As much as I love Autumn and all the colors of the Trees..
a snowy day is magical!!! Thanks again for all the Christmasy Cozy Titles you sent my way..
Merry, merry…I am reading Murder At Mistletoe Manor by Holly Tierney-Bedord..Its a Novella…I am hearing a lot about the Cherringham series by Neil Richards…I might read that next…Merry, Merry.. Happy day after Thanksgiving to all. For the first time I have the Hallmark movie channel so have been enjoying most of the Christmas movies. I didn’t read any Halloween cozies but did read Death of a Turkey (Kate Borden) and then started on a stack of Christmas cozies. Currently reading We Wish You a Merry Murder (Valerie Wolzien) even though I’ve not read any other books in this series. comments. Thank you, Danna, for all the information you furnish. PamB, a belated happy Thanksgiving to you too! I’m glad to hear you enjoy the site so much – it does help make keeping up the blog more worthwhile to hear this sort of thing! As a writer, I realize that my new mystery is a cozy. My question to you is, does the mystery have to be written at the very beginning of the novel, or do you prefer learning about the characters first? Mayor’s Wife, I think that different people might have different preferences, but unless the sleuth is a private detective or a police officer, it might be better to introduce them first. After all, one hallmark of a Cozy is that the sleuth is usually an amateur, so it might be better to present them in their element first. Happy Day After Thanksgiving! Currently I’m reading Knit Your Own Murder by Monica Ferris which takes place around Easter. Need to get a few Christmas cozies lined up for the next month. Karen, happy belated Thanksgiving to you too.